The 1990s have been marked by a wide-spread awareness of the convergence of environmental, economic and social problems and issues. Many local workers have begun to recognize that severe setbacks or even collapse of their local economy is strongly related to environmental problems: either to the depletion of local resources (such as timber, fish, or minerals) or to severe pollution and degradation of the local ecosystem. 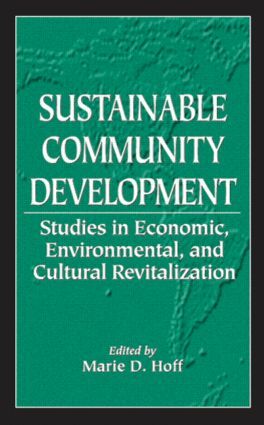 This in-depth collection of case studies of urban and rural communities committed to a process of sustainable development provides a more detailed description of this dynamic process than was previously available. This provocative book demonstrates the commonalities in approach across a wide variety of environmental and cultural settings, examining an emerging consciousness from cultural, economic, social and environmental viewpoints. "Only every now and then do we have the opportunity to learn about efforts to make real some rendering of what could be sustainable -on-the-ground, in the community…presents such an opportunity…is well worth reading. It is not doctrinaire about what works, it is rich in its portrayals, and it does not allow for easy trademarks and formulas; also, it offers insights about the role and perspective of the researcher in relation to the community. For environmental practitioners who hold themselves to a complex view - beyond the straightforwardly ecologic - these studies will prove to be very helpful."